We're approaching that time in the summer when everything starts to feel a little stale. You've worn your formerly new spring buys to death, and it's far too hot to even think about putting anything heavier than a flimsy piece of cloth on your body. Good thing you can get a new dress, cool sandals, or fun sunglasses without spending a fortune. And if your closet needs a few other things, such as a new bathing suit or a pair of shorts, we have you covered too. Some of the best summer clothes cost less than $70, so read ahead and give those basics a refresh. With its slim fit and longer sleeves, this is the perfect piece for tucking into a skirt or high-waisted jeans, without having it gather weirdly at the waist. When it's nearly 100 degrees outside, you're not going to want to wear anything tight or sleeved. Throw this loose-fitting striped camisole over billowy pants or a skirt, and pray for a breeze. 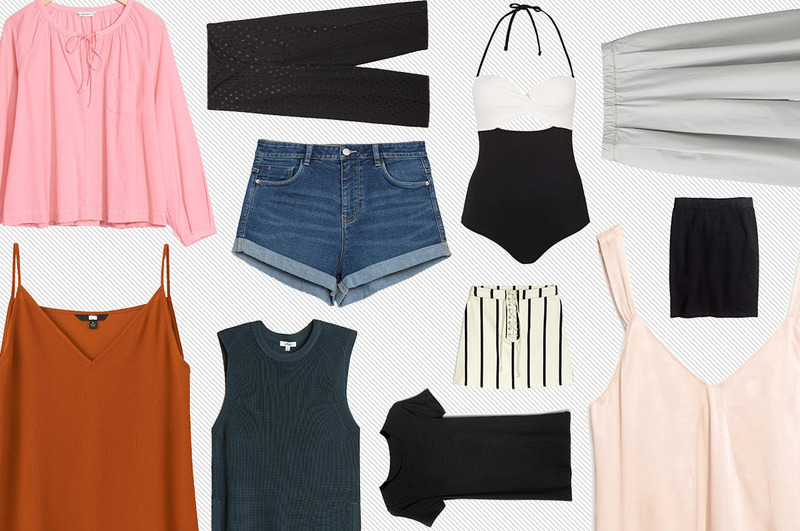 Nothing is more versatile than a plain camisole. Wear it with jeans or a skirt on the weekend, or layer it under a blazer — it's cut high enough that you could probably get away with it in certain office environments. Is it summer if you're not in a pair of jean shorts? No. This Zara pair features a high waist, so you'll still feel covered. Plus, they're inexpensive enough that you can get them muddy, sandy, or covered in saltwater with zero regrets. Bare legs are basically a given from May through September. If you'd prefer to wear a mini rather than shorts, this striped version is a fun update to a classic style, which you can wear with a tank top now and a sweater come fall. Shaving your legs daily is a pain. For those lazy days, culottes and midi skirts are your friends. This lightweight, silky, black pair features subtle polka dots and won't cling to your skin in the humidity. You can never have too many good pieces that you can just throw on and go. Throw a white shirt over this and head to work, or add an off-the-shoulder top for the weekend. In the color of the season, this billowy top works equally well with a slim skirt as it does with shorts and a bathing suit. Yes, it's almost a cliché at this point to own a French-inspired striped tee, but you know you can wear it with virtually anything in your closet. Most slim skirts have a reputation for being impossible to walk in, but this one is cut with spandex. You can pull it on and still easily eat a second scoop of ice cream. Maybe you have three more weddings to attend this summer, or maybe you just want something you can throw on for a night out. Either way, this midi dress is simple enough to warrant multiple rewears. Whether you throw this into your weekend bag or dig it out from the inevitable pile of clothes that develops on the floor after a long week, it doesn't matter — it'll still look great, and wrinkle-free. Need an inexpensive bathing suit you can throw on for a weekend by the water? This black-and-white one-piece is simple enough that you can wear it for several summers without looking dated. Try it over slim pants for the office, then add on a white shirt in the fall. Add flat sandals and you can make it out the door in five minutes. Added bonus: It can also double as a chic cover-up for your swimsuit.